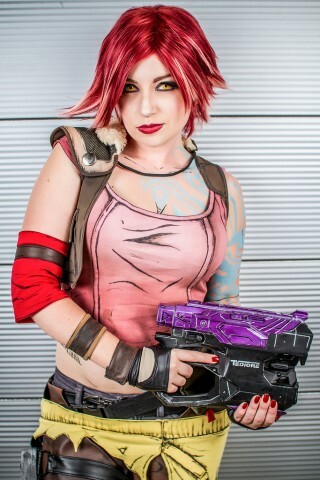 Lilith from Borderlands 2 Cosplay « Adafruit Industries – Makers, hackers, artists, designers and engineers! For the pants I used a upholstery vinyl for the chaps with stretch black on the inside to make them formfitting but moveable in. I purchased a pair of jeans second hand, removed the back pockets and dyed them dark grey. Unlike the first Lilith pants, I actually left the chaps and pants separate so that way the chaps didn’t pull down the pants when I kneeled down and such. The yellow waist wrap is made of yellow stretch knit. I aged it with bleach and dyed it a tan color. The pink/red undershirt was made for scratch as I felt the time I would spend looking for one to modify I could just make it. I used a white stretch knit to make the shirt. I then dyed it with a variety of pinks, wine, reds, oranges, tans and browns to make it the color you see. I also used some paint in there to get nice and dingy. The vest was patterned off the old one I made and used the same material. Made the exact same way as the previous one, but this one was just cut up! To prevent the edges from fraying on the one side where it was cut, I used a lighter to melt the edges. The various arm and hand accessories are made from cotton, pleather, knits and fishnet. Gloves are matte metallic spandex. She aged the fabric with tan, gray, and black spray paint. She touched up with paint pens and brown fabric dye. She says if the effects look overdone in person, they’ll probably look perfect on camera. Read more at Wind of the Stars’ blog.